In my first post about Ivan Baburin, I concentrated on the ways that he likely felt at odds with the estate administration or with Sheremetev—he was a prosperous man by nearly any measure, having purchased his freedom and entered the Moscow merchant society, apparently quickly moving into the first guild. His consistent success allowed him access to the status of honored citizen, as well. At the same time, however, he paid dearly to continue to manufacture in Ivanovo. And more troubling, he paid more dearly than his fellow former serfs by a considerable amount. Given his success, some extra payment might have seemed acceptable, but it’s hard to imagine that he did not feel some resentment at the degree to which he was burdened by payments to his former owner in comparison to others. The Church of Christ’s Birth in Ivanovo; Ivan Baburin contributed to its construction. (I think.) Source: Фотосайт Владимира Побединского. There is, however, another way to view the story of Ivan Baburin’s experience after his manumission, one that focuses not on sources of resentment, but instead on a much more positive view of his relationships in Ivanovo. This vision of Baburin’s later role in the village focuses not on his relationship with Sheremetev and the administration, but on his relationship with the Ivanovo serfs, with his own workers, and with his fellow factory owners. When looked at from this point of view, Ivan Baburin seems to have been both well respected and well liked in Ivanovo after his manumission. 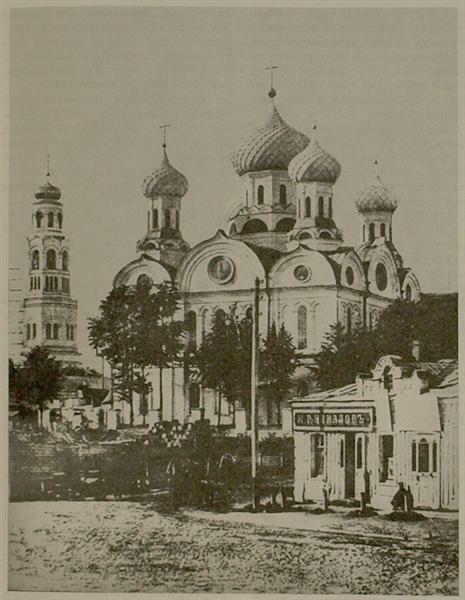 Although his decision to join the Moscow merchant society as opposed to one of the more local merchant societies of Shuia or Vladimir might have marked him as someone with hopes of social advancement and therefore separation from his former society, in the middle of the 1830s he was instead described as a model factory owner in the village. The Sheremetev main chancellery was concerned with how things were going in Ivanovo after so many of its wealthy members had been freed, and for good reason. In 1835, it addressed an earlier report from the Ivanovo estate administration of how residents of the estate felt about their former fellow serfs. Overall, the serfs believed that the new merchants were getting too much benefit for not enough payment—this is likely why they had produced lists like the one that ended with a lament that the Ivanovo serfs were falling “into despair, and even into thievery and drunkenness” due to new demands for money. By this account, Baburin was going over and above what he had to do by his agreement with Sheremetev, and helping out the village in other ways. He was, it is hinted, charitable, a philanthropist when it came to helping out the larger serf population. Baburin also engaged in other philanthropic acts. He was the moving force behind the construction of a new church in the 1840s, and also contributed to the construction of a poor house affiliated with another church in the village. In 1846 he began to hold Sunday school classes for children working at his factory, a fact that was lauded as a particularly good thing by the provincial mechanic I. Nesytov. The students had classes in religion, in Russian grammar, and in basic accounting. In this alternative vision of Baburin’s experience of life as a merchant in Ivanovo, he is well settled into the larger life of the village and region. He is successful, he is charitable, he is a contributor to the society of his fellow merchants and of the local serfs. This, then, is also the context of his eventual protest—or perhaps in this context, his statement of principle?—against his agreement with Sheremetev.